Span-America Medical Systems offers the industry's most comprehensive line of specialty solutions for pressure management and patient positioning. Span-America offers a full line of powered and non-powered support surfaces and overlays to address both Treatment and Prevention of pressure ulcers. Span-America carries a full line of seat cushions to address wound treatment, positioning, wound prevention, and comfort. Span-America introduced Span+Aids, the industry's first-ever line of patient positioners that are specific to certain body sites. Span-America offers Selan® skin care products, a comprehensive line that can be used for treating dry skin, fungal infections, and more. Our Risk Manager and Risk Manager XL beside safety mats provide stable, comfortable fall protection suitable for a range of settings. 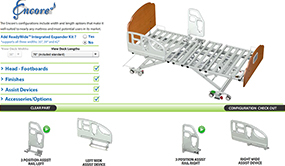 Span-America provides a full line of innovative medical bed frames and related products for the long term care market. From overbed tables and seating to casegoods and more, Span-America offers versatile furniture products for diverse needs.